Synopsis: The dark fantasy follows a high school sophomore named Akihito Kanbara. Although the boy appears human, he is half youmu and invulnerable to wounds because he can heal quickly. One day, Akihito meets freshman Mirai Kuriyama when it seems she is about to jump from the school rooftop. Mirai is isolated because of her ability to manipulate blood, which is unique even among members of the spirit world. Disturbing events begin to unfold after Akihito saves Mirai. 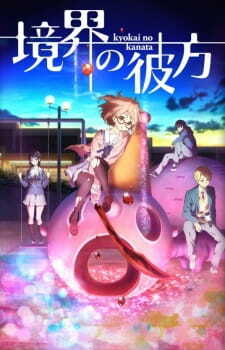 Kyoukai No Kanata (Knk for short here) starts off as your typical slice-of-life anime. Except the fact that demons coexist with humans. Somewhat unoriginal, but it is still a good show. That being said, there were several moments throughout the series were I was genuinely confused as to what was happening. Who is Izumi Nase? Why is Akihito's mother so special? What is the "Beyond the Boundary"? None of these questions are addressed. This becomes more frustrating as the anime continues, because the story unravels into a complex and twisted story line. Even after re-watching the later episodes, I still didn't completely understand what happened. With this confusion and lack of details, the overall anime, unfortunately, suffered. It is Kyoto Animation. No matter what they produce, the art and animation will always be stunningly remarkable. I personally loved the character designs for Mirai and Hiromi. As well, the animation and skill it took to produce that dance scene. . . I think I watched that episode four or five times simply for the animation. how good their animation skills are. The opening song was okay, but the ending song was terrific. Something about the singer's voice and the meaning of the song really moved me, especially the line, "I never say goodbye." It fits so well with the anime's overall theme. The soundtrack throughout the action scenes blend well and does not disturb the fluidity of the scene, which is something I find rare. The main group is well-knit together and are a humourous bunch. They seem so realistic and innocent that it would be heartbreaking to see anything bad happen to them. And, halfway through, I can almost guarantee you that will continue watching to see Mirai and Akkey get together. Whether that happens or not, I cannot say. You will have to watch in order to find out. Going into a little bit of detail, Mirai's character is very interesting. Her care for others at her own expense is admirable and, later on, requires a lot of bravery. She thinks that she will not benefit in life because of her cursed blood, so she gambles her own life in order to keep her friends alive. As well, her kind nature and complete innocence is so adorable that I felt very protective of her. Aside from the earlier criticism about the storyline, Knk was a great anime to watch. The slow and comedic beginning was pleasant, until the darker and more confusing side of the show was revealed. Of course, if you include demons into an anime, things get confusing, but the execution of the later episodes was a major disappointment. Though the art, comedic relief and romance-in-the-air helped heal those wounds. I recommend this anime, but be prepared for the surprises in store. I suggest that you know a few people who have also watched the anime, so you can ask for clarification as to what is going on. Trust me, you will explanations and clarifications if you actually watch this anime for plot.